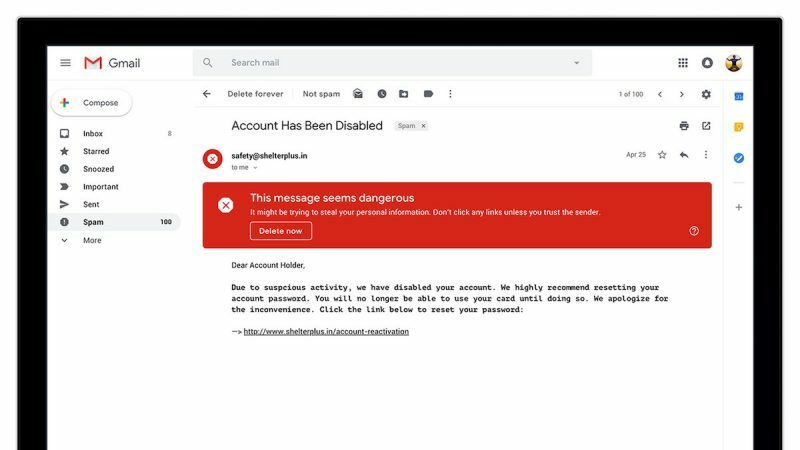 Google launched its redesigned Gmail web interface today, introducing several new features including some the company trialed in its Inbox for Gmail app. The launch is a phased rollout, so not all users will have immediate access to all the changes listed below, and those who do will need to opt-in to them. The major visual difference comes in the form of a new right-hand sidebar that provides multiple options for customization. Users can choose to add Google Calendar, Google Keep, or Google Tasks in the side window, or collapse it completely and focus only on their inbox. Likewise, the left-hand panel can be collapsed now, too. The inbox view has also been updated with the ability to perform actions on messages without opening them. Hovering over an email with the mouse cursor displays buttons to archive, delete, mark as read, and a new "snooze" feature. Opting to snooze an email hides the message until later in the day, tomorrow, or later in the week. 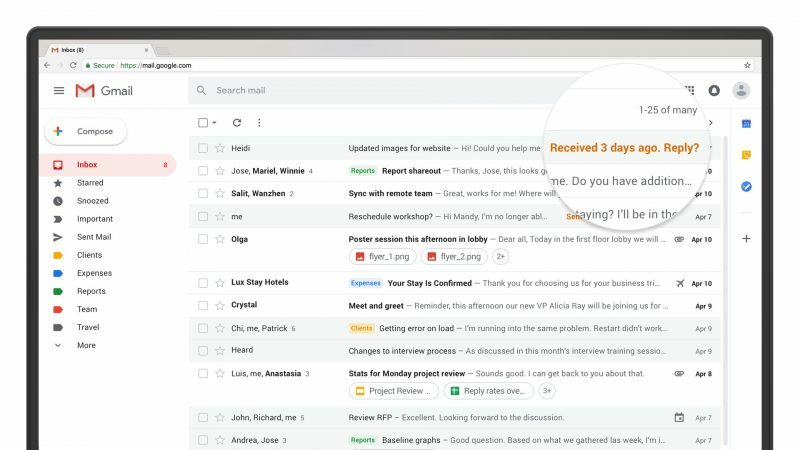 The function has been brought over from Inbox for Gmail, but currently there doesn't seem to be any way to activate it for an email that's currently open. Google has also introduced a new AI-powered feature that "nudges" the user to follow up and respond to messages it thinks are important, offering up quick reminders for them to take action. Also, the smart reply function has been brought over from the Gmail mobile apps, allowing users to respond to emails quicker. In addition, Gmail is rolling out a number of security/privacy features in the coming weeks, one of which is a new confidential mode. This lets the sender set a time-limit in which a message can be accessed, should the email contain sensitive information. It works by sending a link to the content in your inbox that the recipient clicks, rather than sending the content in the email itself. There will also be a new two-factor authentication (2FA) option for confidential individual messages, which means recipients can be asked to authenticate with a passcode via SMS message before they're granted access to the content of an email. Elsewhere, Gmail now includes integrated rights management (IRM), which allows business users to block the forwarding, copying, downloading, or printing of specific messages, offering a welcome extra line of defense against accidentally sharing certain emails. Also new under the hood are a series of machine learning algorithms to help protect users from phishing scams. The user-facing element of this redesign comes in the form of warning banners and color-coded alerts. In tandem with the web interface redesign, Google is also launching a new Google Tasks mobile app later today on both iOS and Android. For more information on the new Gmail web features, click here. The five people in the world who sext over email, rejoice! Um... what? No. I mean, sure I can always take a screenshot, but my mail is mine. Don’t want people to share what you said, then don’t say it. Maybe I do not get it. When is this going to be a good idea for a company to use? They aren’t going to use it on a coupon because if it really is a one time use they would just make the coupon only work once. If it’s for a rather unfriendly message it will only fuel the fire when the recipient sees it can’t be shared. I get that there are some documents a recipient might not want to share, but that should be their call and not the business. If you are using gmail as a company email, then no that email isn’t yours. It’s theirs. This feature would be to prevent someone from quickly sending company info outside of a specific circle due to confidentiality. Think of accounting, HR, and legal. Just an FYI for UK and European folk, its not released here yet. I've been told it may be 24 hours. Where is night mode? Too much white. If you want it to change depending on context (time of day) there used to be a Theme for this but I can't find it now. Perhaps it will show up again later. This lets the sender set a time-limit in which a message can be accessed, should the email contain sensitive information. It works by sending a link to the content in your inbox that the recipient clicks, rather than sending the content in the email itself. This isn't anything I know about, so this might be a stupid question, but as an attorney you work for the client right? So doesn't the client always have the right to share your communications. Isn't the privilege a restriction on you? It is the client's privilege. In other words, it is the client that can assert it and it is only the client that can decide to waive it. Yes, the client always has a right to share the attorney-client communications with whoever they want. So the client can always ask the attorney to resend the email without the restrictions. But attorneys might still want to default to using the restrictions. However, ethics law has evolved such that it is pretty much presumed that client always wants to keep and assert their attorney-client privilege whenever it is possible unless the client very clearly doesn't want to for some reason. Breaking privilege is the right thing to do sometimes, but only after careful consideration and counsel. Attorneys have been punished for not taking basic steps to preserve the attorney-client privilege in the past. It could be argued that if sending a more secure email takes only a single extra click, and that single extra click could prevent the client from accidentally and unintentionally breaking privilege, the attorney has a duty to send the more secure email unless asked not to by the client. To some relatively minor degree, emphasis on minor, attorneys have a duty to take some precautions to prevent stupid clients from doing stupid things. This way if the client does go and do something stupid, the attorney can say: "I sent it with some basic protections, the client couldn't have just accidentally forwarded the email. He must have taken intentional and deliberate steps to circumvent the basic protections in order to forward that email. Had he asked me first, I would have advised against it, but he didn't. So I'm not responsible." This isn't about security. It's about allowing business to establish even a wink of belief that they have a right to tell me what I can do with my mail. That seems reasonable... but I don't like the idea that the general population could become used to business restricting sharing of messages. Once people think that's ok businesses may try and claim more ownership over the message. So while you use case seems valid from a outsiders perspective I am not convinced it's worth the risk. I think you might be overthinking it. First, we're talking about Gmail. Don't forget the "G" stands for Google. If you use gmail, or you send an email to anyone at a gmail address, you've already consented to having one of the largest businesses on the planet read and index you email communications for the purposes of advertising and who knows what else. (Even if you host your own email server, it's pretty difficult to avoid ever sending emails to people with a gmail addresses or gsuite email domain. One way or another, some significant percentage of your emails will be traveling over google servers.) But in exchange, we get a top-notch webmail client with almost unlimited storage. Quid-pro-quo, some might say. Second, the author of a message already "owns" the message as it is today. Sure, you can distribute it, but it doesn't mean you're allowed to or that it is legal. For example, if I write an essay and email it to you, you can technically forward the email along to whoever and I can't feasibly stop you. But if you take my email or essay and publish it in a book, I can sue you for copyright infringement and win at least an injunction, in addition to possibly money damages. Likewise, if you publish my email or essay online, I can sue to have it taken down for the same reasons. This doesn't apply to just essays, the copyrights to all written communications belong to the author. The reality of the internet making it impractical or infeasible to stop the dissemination of interesting information doesn't diminish the ownership or rights as they are today. Third, anyone running a business with any brain cells knows that once something is emailed, it might as well be public. Truly confidential information should never be emailed. This is why hospitals, banks, law firms, accounting firms, etc. don't email sensitive documents - but rather email you a notice asking you to login to their website and view the sensitive documents there in order to control and log access. In other words, businesses have other ways to retain their rights and ownership over written communication. If they cared about that, they wouldn't email it in the first place. To give a plausible scenario that makes me happy about this. I'm an attorney and communication between my client and I is privileged unless one of us breaks privilege by inviting another person into the conversation. If my clients can't forward messages that I send to them, it provides an extra layer of security that prevents them from inadvertently breaking privilege through opening the conversation up to others.